While it is cheaper than the Galaxy Note 8 for the consumers, the new Galaxy S9+ is apparently the most expensive Galaxy series phone to build. Samsung reportedly spends $379 (approximately Rs. 24,700) in manufacturing the Galaxy S9+. This is more than the cost incurred in producing the Galaxy S8+ and Galaxy Note 8 as well as the Apple iPhone 8 Plus. However, the overall cost of goods sold (COGS) for the Galaxy S9+ is still said to be cheaper than what of the iPhone X. The cost of manufacturing the Galaxy S9+ global version is $10 (approximately Rs. 650) more than that of the Galaxy Note 8. On the other hand, it is cheaper than the cost of producing an iPhone X, which stands at $389.50 (roughly Rs. 25,354), according to research firm TechInsights. The reported cost, which includes the price of various hardware components and supporting materials as well as final assembly and test charges, is significantly up from the Galaxy S8+ that incurred $369 (approximately Rs. 24,000). The key reasons behind the increase in the manufacturing cost of the Galaxy S9+ over its predecessor are noted due to a better processor, which is the Exynos 9810 in case of the global version, increased LTE speed, and a dual rear camera setup that has 12-megapixel and 8-megapixel image sensors. Likewise, there is increased capacity RAM from the 4GB LPDDR4X one on the Galaxy S8+ to its 6GB version on the Galaxy S9+. The new Exynos processor notably costs $68 (approximately Rs. 4,400), while the 6.2-inch Super AMOLED display on the new Galaxy flagship is estimated to cost $72.50 (around Rs. 4,700). 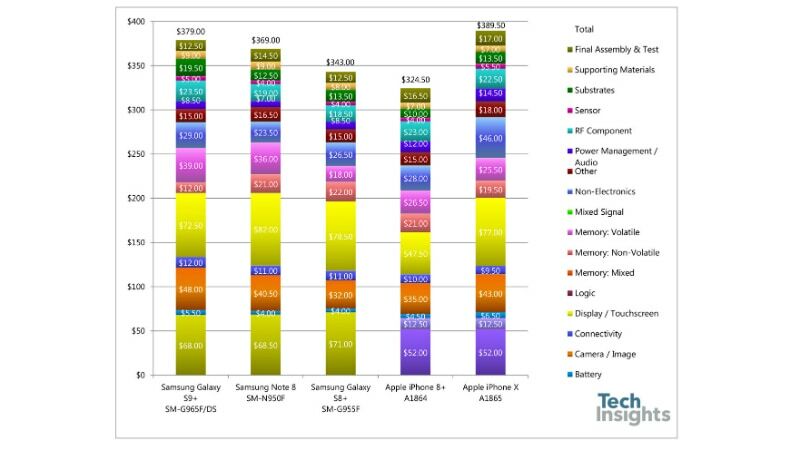 Folks at TechInsights additionally compared the cost of building the Galaxy S9+ with that of the iPhone X and iPhone 8+. The comparison shows that the iPhone 8+ is the cheapest handset to produce between the three, at a total COGS of $324.50. The iPhone X, on the other side, is the most expensive one in the competition. It has been spotted that the notched display of the iPhone X and its glass and steel housing cost more than that of the Galaxy S9+. However, the A11 Bionic chip is found to be cheaper than the Exynos 9810 at a cost of $64.50 (roughly Rs. 4,200), and similar is the case of the dual rear camera of the iPhone X as well as its TLC NAND flash and 3GB of LPDDR4 RAM.